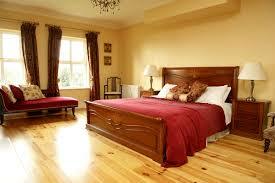 Really enjoyed our stay at Glendine Country House. Lovely place in a nice area. We will definately stay here again next time we are in the area. My family and I stay at Glendine whenever we can when we visit Arthurstown. We absolutely love it - such a lovely house, grounds and interesting animals! Breakfast is always delicious and a piece of marmalade cake and tea after a long journey, in the window of the drawing room can't be beaten. Thank you to our hosts! Fantastic accommodations! A delicious, filling breakfast enhanced by a beautiful room and table setting! Our room was very spacious, spotless, and looked out over the waters and mountains! Beautiful!!! Our host and hostess were extremely friendly and welcoming! Would stay there again in a heartbeat! Enjoyed our visit, beautiful setting with views all around, rooms comfortable and clean. Host were very accommodating and informative. Breakfast is a terrific start to a day exploring the countryside. Will be back next time we are in the area! Bravo! Amazing place. Should’ve stayed there longer than one night. The view from the room was stunning. Everything was perfect. Thank you. 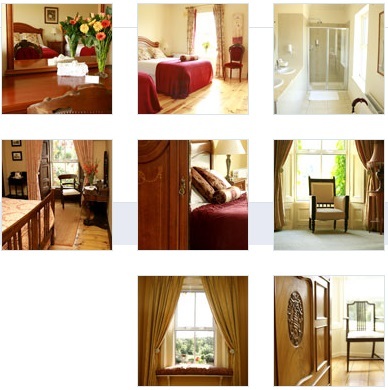 Each room is uniquely named after a castle in the area – ‘The Hook Room’, ‘The Slade Room’, ‘The Dunbrody Room’, ‘The Tintern Room’, ‘The Ballyhack Room’ and ‘The Kings Bay’s Suite’(Please see Gallery). The original large ensuite bedrooms have pitch pine floors, wooden shutters and some overlook the Estuary. The new bedrooms that have been added are absolutely beautiful, large and are furnished with antiques and as you would expect, have both baths and power showers, T.V., Radio, Hair Dryers and free internet access plus all other mod cons. The Entire House may be reserved by a single party. Rates are shown in euros and are per person sharing and include Full Irish Breakfast or alternative – menu available (organic and home produced where possible) (9% VAT incl.). Vegetarians & Coeliac catered for (please advise on check in). 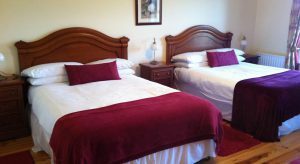 Children are welcome and cot(s) and high chairs available on request – Dogs are also allowed – individual room allocated – We have an in-house Dog sitter that can look after your dog if you need to go out for the evening!! As we are a private house and only take guests by pre-arrangement, we cannot easily replace cancellations. When a reservation is cancelled less than 21 days beforehand, a fee of 50% is taken for the first night. When a reservation is cancelled within 2 days of arrival date the full accommodation charge can be levied (less €10 breakfast charge per person). In a no show situation the full accommodation charge will be levied. In a group booking situation a fee of 50% should be paid when making the reservation, with the balance due 6 weeks before arrival date. (A group booking is where one party has booked the entire house).